It reminds me of playing with pasticine, and since I love plasticine, I am having a very good time. I guess I am a little obsessed with molding chocolate these days, and have been exploring various media, with varying degrees of success (including some truly frightening gelatine molded avocadoes). This week, I have acquired some culinary grade silicone, and am searching the house for things which will make suitable casts. It has been a long time since we’ve had the Lego box out (I miss that) but my son is very helpful, shifting boxes and helping me pull out pieces suitable for not only being cast in chocolate, but for building a wall around the silicone, to keep it in place. This idea came from a very helpful, wonderfully techy website. In fact, I have borrowed his idea of casting a Lego Guy and a brick, among the more elaborate medallion shaped pieces I have found in my jewelry box. I am not really a jewelry person, aside from funky earrings, but I can’t bear to get rid of these two brooches as they were my Mum’s. Apart from venturing out a few times for auditions, this is the first time they have seen daylight in years. I am beta-testing all of these casting media because I have an artist friend who is keen to try chocolate molding some of her exquisite tiny sculpted pieces and before I would dare embed one of her lovely creations in questionable goop, I figured I’d better have a go with some sturdier treasures. I know Mum would forgive me. 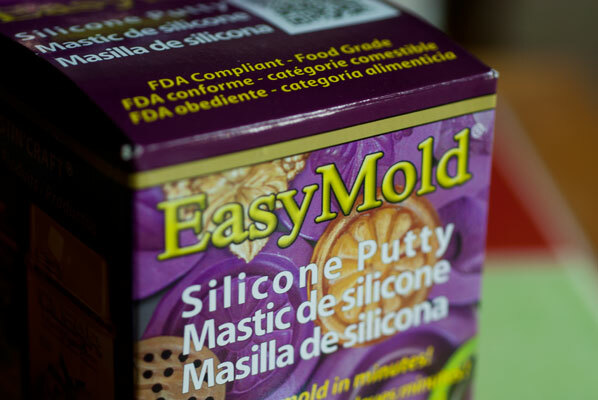 I am using a product called EasyMold, which is one half pound of food grade silicone putty. It comes in two tubs, which must be mixed together in equal proportions, one of which is a catalyst which sets a chemical reaction in place. Because of this, good planning is key, as there is a limited window, once the two compounds have been mixed together, to form the desired molds: about 3 minutes. The molds stiffen and become usable in 60 to 70 minutes, depending upon ambient temperature. It’s a bit like working with chocolate in that respect. Except that chocolate can be re-melted, and mistakes made to disappear. Once these molds are set, that’s it. 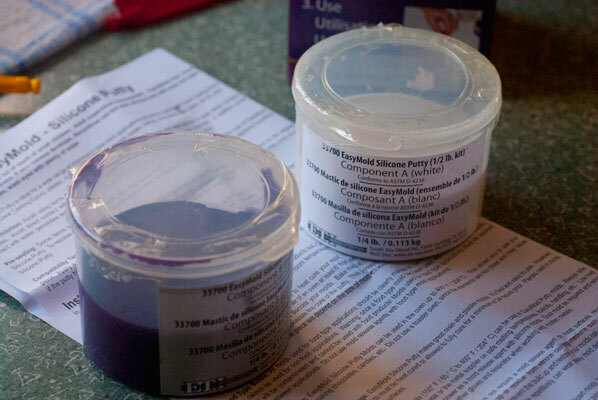 So, I open up the lids, scoop out the one white and one purple blob of putty, and get mixing. 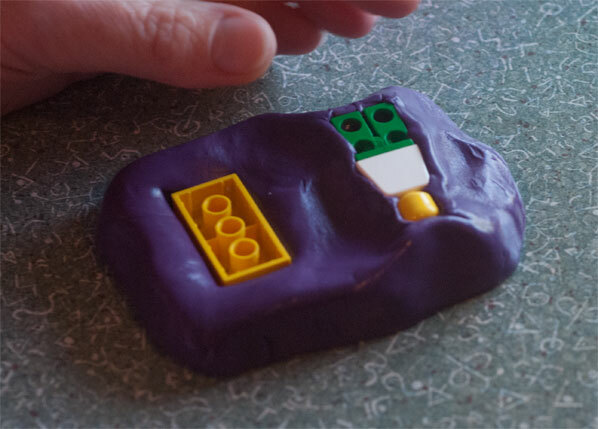 About the consistency of Silly Putty, it mixes together easily, and I am able to get three Lego bricks, one Lego Guy and one slightly larger Playmobil figure into the putty, before it starts to set. Because I have entirely forgotten to build the box around the putty, it has flattened out, and is pulling slightly away from the sides of the pieces – argh! Fortunately, I have another box of the magic stuff, and this time I put together a box made of Lego, to hold everything in place. I also use the leftover tubs from the silicone, to create petri dishes for the other bits: more Lego, and the two brooches. Seventy minutes later, I pull the embedded pieces out. And this is where it seemed like everything began to turn into a gloriously EPIC FAIL (a phrase of my sons’ which has stood me in good stead a few times over the course of learning to work with chocolate). The first Lego Guy was embedded with his arms at 90 degrees from his body. I had thought this would be the path of least resistance for unmolding him, but his little claw-like Lego hands stuck firmly in the mold, and no amount of coaxing with a tweezers could extract them. The hands remain entombed to this moment, mocking me with their bright yellow colour visible against the purple of the silicone. The bricks came out easily and left a good impression, the brooches were a disaster, because I did not get enough silicone embedded into the surface nooks and crannies, and did not push them deep enough into the substance, to build up the sides, so the molds are very shallow. The weather in Vancouver has been absolutely appalling, with monsoon-like rain for weeks and weeks, but on this day, it became very hot and slightly humid. Undaunted, I set to work to temper some chocolate for the molds, curious to see what my impressions would produce. It seemed to be taking forever to get the temperature to drop to the required 27 degrees Celcius with the seeding process, and in my impatience, I dumped half of the chocolate on a marble slab to tablier it – after I had already added the seed chocolate, and had been stirring for quite a while. In hindsight, this was not one of my better ideas. The chocolate obligingly began to pull together on the slab, and I glibly added it back to the remainder in the bowl. It did not occur to me until later that, at that moment, I probably knocked the whole mass out of temper, as the chocolate remaining in the bowl would have cooled down too much for good v-crystal formation. I had used my microwave to heat the chocolate, on half power, and had not kept the bowl sitting on a heating pad, as I usually do, because it was such a hot day. I got the chocolate into the molds, and gave each one of them a hearty bang on the counter. That worked well, so at least the molds are quite sturdy! I placed them in my usual spot, on the marble slab, off in an airy corner of the kitchen – the usual chocolate setting spot. Except that today, unlike any other day in the recent past, we had full sunlight, still humid air and great heat all afternoon. I left them overnight, but by then the damage was done. In the morning, when I unmolded them, I almost burst into tears. Horrible, pitted, grey-white bloom covered chocolate forms popped out of the molds (at least they did release quite easily). In a fit of peak, I hurled them all back into the primordial soup of the bowl of leftover chocolate, and let the already scorching sun of the new day melt the whole thing into a smooth, unmolded mass of liquid chocolate. There. All evidence of my Epic Failure gone. As I mentioned before, this forgiveness is the part I like about working with chocolate. I poured it all out on a Silpat mat and let it harden. And next week, when I have recovered enough to be able to look at the molds without flinching, I will have another go at making the bricks and Lego Men. Once in the molds, the chocolate needs to be cooled down faster, which may mean an “in and out of the refrigerator” morning in the kitchen. I will also start again with pristine chocolate, as I am a little concerned that the chocolate I have already used will be too viscous. I will use this chocolate for ganache. Sigh. This whole week has been a series of Lessons Learned, as we say in the Ecole Chocolat. But it’s just a minor set-back, and another opportunity to go back to the basics, slow down and have reverence for the chocolate and the craft.